Buddhists make a big deal about how disadvantaged people are by having the illusion of self. The rhetoric implies that having a sense of self is a severe disability. Since it is axiomatic that it is up to each of us to make progress on the path, it's further hinted that those who still have a sense of self are culpable for their own disability, as though we are simply not making enough effort. I find this a rather unattractive version of Buddhism. To my knowledge, the breakthrough to non-self has always been the preserve of a few who have the temperament for intensive practice and the opportunity to pursue it. No doubt some genetic and environmental factors are also involved, but this only reinforces that it always was and always will be a minority who make that kind of breakthrough. The idea that we all might make this breakthrough is a quaint dream. On the other hand, this view overlooks the good that people with selves do, the great art that they have created, and the general advancement of humankind from science and technology (better health, longer life, lower infant mortality, less violence, etc). Buddhism implemented on a national scale, on the other hand, has almost always led to repressive, authoritarian politics, rigidly stratified societies, and entrenched privilege, along with poor standards of living, especially for the poor. So if we were looking for ways to save all beings from suffering, or at least reduce suffering for all beings, then the evidence suggests that Buddhist rhetoric is vastly overblown: basic education and healthcare is probably more effective. The eradication of polio has done more for the reduction of suffering in the world than Buddhism ever did. This kind of discourse which sees self as a a disability is more prevalent now that it was when I became a Buddhist twenty years ago, partly because of the rise in prominence of Advaita Vedanta in Western countries or at least people who employ Vedantin methods of undermining the sense of self. Those who do this, like to refer to it as "Advaita" (non-dual), but I prefer to use Vedanta to keep it clear what kind of religious ideology underpins the methods and worldview associated with the approach. 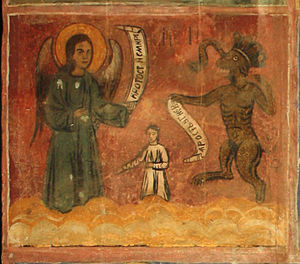 A Vedantin is typically seeking the non-duality between soul and God, two concepts foreign to Buddhism. While self-enquiry seems like a good idea, we also ought to be enquiring into the worldview espoused by Vedantins and asking why the Vedantin who claims to have no self talks about it in such different terms to the Buddhist. None Dearer than Myself (04 Sept 2009). Why do we have a sense of self? (21 Aug 2009). In these essays I expressed some of my doubts about the negative rhetoric around self. I tried to show how vital the development of a healthy ego is. One might, perhaps, transcend one's ego, but the idea that we could develop from scratch as human beings without an ego seems fanciful. A whole raft of behavioural and cognitive problems emerge from the lack of a well-defined sense of self. If the sense of self fails to develop in a person, or is compromised by disease or accident, then (contra the religious narratives) that person really is disabled. However good it might seem to lose your ego as an adult, having no ego to start with is uniformly disastrous. This seems never to be acknowledged or discussed by advocates of non-self. I've argued that the problems ascribed to "egotism" seem more often to be the result of an under-developed ego rather than too much ego. I've also expressed doubts about the possibility of a functioning morality in the absence of a self (Ethics and Nonself in Relation to the Khandhas, 21 Mar 2014). I want to return to this last theme in this essay. The different attitudes of Buddhist and psychological models partly relate to different definitions of what is meant by ego or self. Which definition we use is notoriously dependent on context and each context requires us to redefine the word. From the psychological side we may say that without what psychologists call an ego, no social interaction or learning is possible. Without a clear sense of self and other we do not develop empathy, for example. Without empathy we could not be moral because morality requires us to see our actions from another person's point of view and feel what they feel (or at least to imagine how they might feel). We also know that people who have personality disorders or other psychiatric problems can get into real difficulty if they take up meditation, particularly the kinds of meditation that undermine the sense of self. Generally speaking Buddhists have been quite reckless in seeing meditation as a panacea and not cognizant of how mental health problems manifest and how they affect a person's experience of meditation (I addressed this to some extent in my essay Rumination, the Stress Response, and Meditation, 22 Jan 2016). So what can Buddhists and Vedantins mean? How can we understand the no-self discourse in the context of contemporary knowledge about the brain and its role in what Westerners call "consciousness". The scare quotes are employed because I'm not sure that there is a cross-over between ancient Indian theories of cognition and modern theories which treat consciousness as an entity rather than a function or process. In other words I am inclined by my Buddhist studies to see consciousness as something we do, rather than something we possess. Traditionally Buddhists use concrete nouns like "mind" (manas) or "thought" (citta), and action nouns like cognizing (vijñāna) "thinking" and "remembering" (smṛti) but they don't seem to use abstract nouns with respect to the mind. So even if a word like vijñāna can be made to mean "conscious", there is no equivalent abstract noun vijñānatva, no conscious-ness. So there is no abstracted faculty of mind under which concrete functions can be groups. In Buddhists texts the functions of the mind are most often grouped under a concrete noun "citta" rather than an abstract noun. These observations often seem trivial, but they point to a radically different worldview that separates us from the authors of the earliest Buddhist texts. They did not think like us at all. Another big difference in how early Buddhists and Westerners understand the mind is metaphorical. In an earlier essay I tried to show that the MIND IS A CONTAINER metaphor, which is almost inextricable from the Western understanding of mental phenomena, is absent from Buddhist texts. Pre-modern Buddhist authors did not conceive of cognition as happening in the mind; nor thoughts, memories etc in the mind. Again, rather than being something we have, consciousness seems to be something that we do. For example it's might be phrased that the Buddha dwelled with a particular state of mind (iminā vihārena viharato) not in it. Hence, I've also argued that where we might be tempted to translate "consciousness" in a Buddhist text, the phrase "mental activity" is almost certainly better (Manomaya: Background to Mind-Made Bodies. 28 Nov 2014). Since my first forays into this field I have discovered the work of Thomas Metzinger, in which I find a very useful paradigm for thinking about selfhood. For example I wrote Origin of the Idea of the Soul (11 Nov 2011) and First Person Perspective (29 Apr 2011) exploring Metzinger's work and how I think it applies to contemporary Buddhism. Metzinger draws on work by Antonio Damasio, amongst others, who I also refer to directly. Damasio has put forward the idea that what the brain does, in the first place, is model the internal milieu of the body for the purpose of maintaining optimal conditions for life. The inputs include information about blood pressure, blood sugar levels, hydration, hormone levels, balance and other forms of internal physical senses, and the state of the gut. The brain integrates these internal inputs with information from the senses about the environment and produces behaviour as a result. The view that this is all that the brain does is called Behaviourism. Behaviourism was a briefly popular theory of consciousness in the mid 20th Century. In a simple animal like the round-worm C. elegans (see Reflections on Living Things. 13 Nov 2013), Behaviourism may well be a sufficient account of the animal's behaviour. Though in a brain with only 302 neurons, it is still not entirely clear yet how it produces behaviour, and attempts to model the brain in a way that does produce behaviour are in their early stages. In more complex animals with millions or billions of neurons something more sophisticated is going on. As brains become more complex, with layers of organisational sub-units, emergent properties become apparent that cannot be predicted from the physiology of neurons. Sophistication of behaviour is correlated to some extent with brain complexity. Generally speaking more neurons with more connections, correlates to more complex behaviours. Though the relationship also has to take into account what subsystem the neurons are in. Neanderthals for example had significantly bigger and more complex brains than their ancestors, but most of the gain was in the visual cortex not in the neocortex. The increase went to improved eyesight, especially night vision, not to improved cognitive abilities generally. In anatomically modern humans, the gain in complexity was in the neocortex which does correlate with improved cognitive abilities. In particular Robin Dunbar has famously showed that there is a correlation between the ratio of neocortex to the rest of the brain and the size of social group an animal lives in. Out of this research came the famous Dunbar Numbers. From the mapping of our internal milieu and via emergent properties we get the most basic sense of consciousness that all reptiles, mammals and birds seem to have. At least this seems to be the most plausible explanation. In fact we still do not know much about what consciousness is or how it is created by the brain. But neuroscience is a relatively young science (a few decades) and consciousness is a big problem. Consciousness, as neuroscientists generally conceive of it, is mainly concerned with moving around and seeking food and mates, but also forward thinking, learning from past experience, and social interactions. In some animals and birds the basic level of consciousness is the basis for an even more sophisticated simulation—a sense of being aware of what is happening, of ownership over the actions that result, of having a point of view—in other words a sense of self. Many animals, for example, recognise themselves in a mirror. One of the tests is to surreptitiously paint a dot on the forehead of the animal and see how they respond. The self-aware animal will look in a mirror, see the dot on their forehead, and try to touch their own forehead to feel what is there. One of the important findings from recent neuroscience is that when we study the many ways in which our sense of self can be compromised by disease, accident, surgery or even perceptual tricks (such as the rubber hand illusion or the virtual reality) we are led to the conclusion that our sense of self can only be a simulation or what Metzinger calls a virtual self model. If the self were "hardwired", i.e. if there were a definite structure or architecture associated with selfhood, such as there are for say visual processing or memories, this would be inconsistent with what we see in neurology cases. The evidence also tells us that the sense of self cannot be divorced from the brain. For brain damage to affect the self the way it does, the self and the brain must be intimately associated. Because of this intimate association of the brain and the mind, physics at the mass, energy and length scales relevant to the functioning of the brain can now rule out other forces or types of matter than those already described. Of course other forces and types of matter may and do exist at other scales, but not on this scale. If there were such forces and they could interact with matter at this scale we'd be able to "see" that interaction and describe it. The fact is that we do not see it. And if we do not see it, then it cannot interact with the matter of the brain to play any role in the mind (see There is No Life After Death, Sorry, 23 Jan 2015). So the self and the mind cannot be wholly immaterial either. We do not need to have all the specifics to draw broad conclusions about the mind and especially that part of the mind which is our sense of being someone, our first-person perspective. Despite the fact that many philosophers wish to hedge their bets, arguing that science is a social construct (or whatever), what we can do with evidence is eliminate certain types of explanations. As intuitive and attractive as other kinds of explanations for mind are, they simply do not explain what has been observed. The two extremes of physical-monism and dualism can be excluded from consideration because they do not generate the right kinds of answers. And this enables us to focus on the type of answers that are at least possible. There are still a range of these, but we do know that only a virtual self of some kind, generated by the brain in some way, fits the facts. The current best explanation of the known facts is that the brain is creating a simulation of a self, integrating many streams of information into a first-person perspective. No one suggests that we fully understand the workings of the brain or how it generates a sense of self. Indeed some argue that theories of the mind have yet to explain anything. But any theory that eventually does explain the functioning of the mind will certainly not be a kind of physical-monism or involve substance dualism. And thus, for example, studying how neurons and brains work in a physical sense will not only be relevant to the study of the mind, it will be essential. This is good news for Buddhists. As regular readers will be aware I am rather antipathetic to the idea that modern science confirms ancient wisdom. For example, I think there is no genuine connection between Buddhism and quantum mechanics. As far as I can see, claims to the contrary are bunk based on a superficial understanding of both Buddhism and quantum mechanics. Just because two bodies of knowledge can be counter-intuitive does not mean that they are in any way connected. However, in this case the idea of virtual self is fairly consistent with some Buddhist ideas about selfhood. It is also consistent with the idea that one can, through concentration exercises and reflection, substantially and permanently alter one's perspective on the world of experience to the extent that one no longer relates to it via a sense of self. If the sense of self were wholly immaterial (a ghost in the shell) or material (i.e. "hardwired"), then meditation could have no effect on it; we could not rid ourselves of the sense of being a self through meditation and introspection if self were anything other than a simulation whose parameters we can tweak through how we think. "As a philosopher, my conceptual point is that only if an organism simulates itself as being one and the same across time will it be able to represent reward events or the achievement of goals as a fulfillment of its own goals, as happening to the same entity. I like to call this the "Principle of Virtual Identity Formation": Many higher forms of intelligence and adaptive behavior, including risk management, moral cognition and cooperative social behavior, functionally presuppose a self-model that portrays the organism as a single entity that endures over time." Here Metzinger has put his finger on the crucial point about living things. Living things act in ways that over time seem purposeful. We move towards goals and to some extent towards meta-goals. I'm wary of a teleological argument here. I mean, for example, that we seek out and consume food as a goal. And in anticipation of this we plant crops many months ahead of their ripening, and then store the resulting food, anticipating future need as a meta-goal. I don't mean, for example, that evolution is developing towards a general goal or anything of that nature. Desire, seeking behvaiour, and reward for fulfilling the desire have to be coordinated at some level. If they were not then we would have real difficulty with basic functions like eating and mating. But crucially moral behaviour requires us to believe that we endure over time. Buddhist teaching on morality openly acknowledges this. The Jātaka stories are all about connecting actions to consequences over time, linking previous lives to present one. Buddhist metaphysics goes out the window at this point, because they disrupt the kind of continuity required for moral behaviour by weakening the links between behaviour in this life and reward in the next (I'll return to this point below). If I believe that I will not be the one to achieve the goal, that it will for example only be achieved by my grandchildren, then I am probably less motivated than if I could see an immediate benefit to myself. The classic example of this is the problem of climate change. Even where climate change is admitted to be caused by human activity, the political will to make the necessary changes is lacking, partly because the time scale over which the changes occur are too long for most people's imaginations, i.e. the not only go beyond the electoral cycle, but beyond an individual human life. Almost no one is willing to commit to spending resources on a project that has almost no immediate benefits, but which will make life easier in future centuries. And as frustrating as this is, it can hardly be surprising. We surely know enough about human motivation not to be surprised by this fact. George Lakoff has described morality as a kind of book keeping exercise (see Moral Metaphors, 8 Nov 2013). Actions create mutual obligations for ourselves and those we have contact with, which may be conceived of as debts. As social animals we are always in debt to our social group, and need to keep track of the debts of the group as a whole. If, for example, food is shared with us a quid pro quo is expected that we might repay in kind or through something of equal value. A social group is held together by a network of these mutual obligations. Where I grew up, people are quite relaxed about taking on social obligations - we make friends easily. In England most people are at pains to avoid any new social obligations, so it's difficult to make friends. English people don't want to be in debt to strangers, though ironically they have amongst the highest levels of financial indebtedness in the world. Different political ideologies evolve out of the different responses to these debts. In the present political climate of the UK we have a government which on has staked everything on paying back existing national debts (despite 0% interest rates) and not accruing any more debts (which by its own standards it is failing to do). We have an opposition which is confused about how to respond. The Brits are largely a conservative nation and don't like to see the government getting into debt. On the other hand household debt is very high and rising. What most cultures do is extrapolate from this social model of fairness within the group and propose the idea that the world is fair. This is called the Just World Hypothesis. I've written about this in connection with the afterlife. Since life is patently not fair or just, the afterlife becomes the place of debt settlement. And an afterlife requires a matter/spirit duality to enable something to survive the death of the body. In afterlife theories in which the afterlife destination is determined by morality, the deeds of the deceased are weighed against the law. In the case of ancient Egyptian myth, as recorded in their Book of the Dead, the heart of the dead person is on one side of the balance and an ostrich feather representing the law is on the other. In some religions God does the judging. Being judged is a distinct milestone on the journey to the afterlife in all moralistic religions. Buddhists tried to skirt this inherent eternalism by proposing that rebirth was governed by the same principle as the arising of vedanā, i.e. that the dying being was a condition for the next living being. But they almost immediate split into factions, each of which developed a different explanation for how this might happen. There was no consensus amongst Buddhists on how rebirth occurred or what it entailed. And no existing explanation survives its encounter with modernity (See The Logic of Karma, 16 Jan 2015). This is because trying to explain the afterlife by generalising a theory of how mental events are related doesn't work. It reduces the connection between actions and consequences. Hence, historically, Buddhists had to sustain two distinct discourses: one with respect morality (summed up as actions have consequences for me) and another for metaphysics (it is not me, but not another either). But in moral terms, as Buddhists tacitly admit, if it is not me that is game over for morality. The second part of the formula, not another, is not important because it is not me. Hence Buddhists both deny that it is you (or another); and at the same time emphasise that it really is you. Getting Buddhists, or even supposedly neutral scholars of Buddhism, to even admit that this duality exists has proved very difficult. One meets incredible resistance and even hostility to the very idea. Even though it is plain as day. Morality, especially Buddhism morality, depends on being aware of and sensitive to the consequences of actions, but, as I say, our metaphysics creates a barrier to owning consequences. The metaphysics is so problematic that Nāgārjuna ends up repudiating the very idea of karma (or a being who does karma) as fictions of "relative truth". He describes them as illusions "like the cities of Gandharvas in the sky" (see Chapter 17 of Mūlamadhyamaka Kārikā). Connecting consequences to actions without invoking eternalism is almost impossible. The early Buddhists simply set aside metaphysics when it came to morality. They set aside the limitations of the anātman doctrine and taught that we are the owners of our karma, the heirs to our karma (Cf. Five Facts to Continuously Reflect On). But if morality is a book keeping exercise and accounts are settled in the afterlife, then where are the books? Something has to provide a memory of our accounts that persists after death. For those worldviews that include a soul or an overseer god this is not a problem. Admitting supernatural entities solves the problem. Buddhists came up with various schemes to allow karma to accumulate and transfer. Highlighting the arguments that each came up with for the other views is a theme of my writing on karma. No Buddhist idea of how karma and rebirth work was universally accepted. Most sects thought that other sects had got the problem disastrously wrong. Morality depends on some connection between the person who acts and the person who suffers the consequence. And in those Just World worldviews in which justice is delivered postmortem, that connection must survive death. And this is precisely where Buddhist metaphysics of no-self are problematic. There are two main problems as I see it. 1. The relation of conditional arising is not sufficient to motivate anyone to act well. I argue that this is born out by Buddhist's own approach to teaching morality. I have already identified a dichotomy between metaphysical and moral teachings. 2. The flat denial of any self in many Buddhist metaphysical narratives, even an experiential self, undermines any possibility of morality. Also if there is actually no self, then everyone would be severely autistic and unable to respond to anyone else. Hence the talk of no-self literally meaning there is no self must be at least partly wrong. Because even those people who claim to have broken the fetter of self-view (sakkāyadiṭṭhisaṃyojana) are still able to interact with people, to recognise them and respond appropriately to them. On the other hand any self we do have at the experiential level can only be a simulation created by our brain to help us navigate the world. The trouble is that existence and non-existent are black and white extremes when we need something a little more subtle. If instead the self is part of a virtual simulation then terms like existence and non-existence don't apply. If we abandon the attempt to prove this kind of all-or-nothing proposition one way or the other and view the self as a simulation then we can start asking more interesting questions. How does the brain achieve the kind of continuity required for goal seeking behaviour and thus for morality? Is it simply memory, or is there a more specific mechanism? Earlier I mentioned the semantic problems of talking about self. Everyone understands something different by the relevant words. I have written about on several occasions the confusion of terminology. On one hand the meaning of ātman in Buddhist circles apparently changes depending on when and where it is being used. Initially the instruction seems to be that because ātman is a permanent unchanging entity it cannot be associated with any of the sense spheres. Thus, it cannot be experienced. And ipso facto cannot be known. There is a strict epistemological limit (despite what Vedantins may say). A permanent entity could not give rise to an experience. Nāgārjuna discusses this: we either always know about a permanent entity (past, present and future); or we never know. There can only be absolute knowledge or absolute ignorance of permanent entities; there can be no middle ground, no change from ignorance to knowledge. So ātman can never appear in experience (and nor can God). This is explicitly ruling out some unnamed extra sense beyond the five physical senses and the mind. There is no possibility of knowing by extra-sensory perception. And yet the same texts clearly believe in what we would call extra-sensory perception: that space is no impediment to knowledge. One can see things that are invisible, hearing things that are inaudible, and so on. That said the knowledge that comes this way is just an extension of sensory knowledge. One might see or hear at a distance, but no new senses are operating. There is considerable confusion over how to translate ātman: soul, self, Self, ego, Ego, and so on. And on how to understand what it means at different times and in different contexts. As far as the Pāḷi texts are concerned they appear to be responding to the metaphysical entity as described by the Upaniṣads (see Gombrich 2009). There the ātman is a permanent unchanging entity that resides in our body, usually in our heart, and is not affected by the changes that our bodies and minds experience; not affected by life or death or suffering. Ātman is always pure and unadulterated. This is not what ego means, nor "self" in the usual sense. It does not equate to an homunculus either. In discussing this issue with a colleague a resolution to this apparent conflict between karma and anātman emerged. 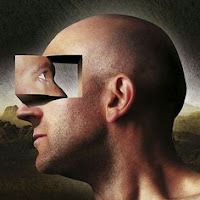 In his view the sense of being a separate self is the origin of unskilful actions. While one has a sense of being a separate self, one will react to experience with attraction or aversion and thus create karma. So for someone with a simulated sense of self (i.e. all "normal" human beings), it is necessary for them to believe that they will suffer the consequences of their actions in order to motivate them to be moral. However, when one eradicates the sense of being a separate self, this also removes the motivation to act unskilfully. Greed and hatred are responses of the self to opportunities and threats in the environment. No self means no greed, no acquisitiveness; no hatred, no aversion. Thus the need to motivate the person to be ethical through the fear of consequences is also eliminated at the same time. Part of the problem we have in understanding this and communicating it, is that the few people who attain this state of spontaneous morality have not yet been properly studied. Worse we still rely on Iron Age or Medieval worldviews that are rooted in profoundly wrong conceptions of the world, life, and people. As yet we have no good way of integrating this perspective into a modern body of knowledge. The beginnings of a way forward may emerge from the work of people like Andrew Newberg who is studying the neuroscience of religious experiences. He calls his field "neurotheology" and is particularly interested in theistic interpretations of religious experiences, but has also studied the brains of Buddhist meditators. Ideally we would have a cohort of people who experience themselves as having a self who could participate in a baseline study before they practised and then again once they had eliminated the sense of self. This would give us a much better understanding of what has happened to them. It would be especially interesting to see if anything changes in the way that they parse grammar. It is common for such people to use pronouns in the conventional way, but to say that they no longer understand the world to be divided up into I, you or they. So how they use pronouns accurately becomes an interesting question. "People in non-ordinary states, produced by psychedelic drugs or meditation, often proclaim sudden, unshakable, universal understanding. They rarely or never can explain their supposed understanding. I think these are probably mostly illusory. Such experiences may give genuine but ineffable insight into some things. I’m reasonably sure they involve no actual understanding of most things." - The Illusion of Understanding. This is also my conclusion from trying to correspond with a few people who talk about being permanently in a non-ordinary state, and many in-depth conversations with a friend who spends a good deal of his time in non-ordinary meditative states. Compare the conclusions of Gary Webber for example. For him the dropping away of ego is the confirmation of the teachings of Ramana Maharshi, an early 20th Century teacher of Advaita Vedanta. Webber understands his experience in Vedantin terms and is critical of the Buddhist teaching of emptiness. Though he clearly doesn't really understand the emptiness teachings. For Webber, for example, free will is an illusion because in his view everything ties back to an unchanging essence that underlies the universe. This combines ideas from the Upaniṣads with the influential Sāṃkhyā school of Indian metaphysics (a huge influence on Patañjali and Yoga metaphysics). For Webber this kind of metaphysical speculation is underpinned by his experience of awakening. But Buddhists who describe more or less the same experience -- i.e. the loss of internal dialogue and a first person perspective -- argue that no such metaphysical speculation is valid. The Awakened can still disagree amongst themselves on metaphysics (as they have traditionally done throughout history, especially in India). This discrepancy plays out in other ways and one that particularly interests me is the use of language, particularly pronouns and grammatical agents. People with no self say that they experience no first-person point of view, that they do not see the world in terms of self and other. And yet they are still able to accurately use pronouns. If there truly was no distinction at all between self and other, then pronouns would be confusing. If there were genuinely no reference point in experience, then one would struggle to accurately ascribe actions or qualities to agents. A pronoun is used to point out the agent of an action or owner of a property. So the awakened still have access to the knowledge of how pronouns map onto situations, on how verbs require agents, and thus on some level are able to distinguish agents. Mind you most of us use pronouns without thinking, so perhaps it is unfair to expect the awakened to have insight into this issue. Until we better understand how anyone with no first-person perspective can use pronouns accurately we have to remain suspicious of the generalisations that those people draw from their experience. Something does not add up. In other words the awakened still seem to be unable to look past their own subjectivity. That subjectivity may be radically different from mine, but it still seems to have the same kinds of limitations. Logical fallacies and biases are still in play. What we need is for a few people who have experienced enlightenment to become lab rats, so that we can study them. We need to better understand the nature of the changes they have experienced in order to better codify them and make them available to other people, if in fact that is desirable. A Review of The Heart Sutra, by Kazuaki Tanahashi. to the Classic of Mahayana Buddhism. When one spends years studying and writing about a text it is always an occasion when a major new publication comes out promising something a little more than the usual recycled clichés. So I welcomed the publication of a new book on the Heart Sutra by respected Zen Buddhist author Kazuaki "Kaz" Tanahashi, best known for translating commentaries by Dogen. The book has received rave reviews from the Zen community and on Amazon. It contains a number of chapters exploring the history of the text, including some material that is new or difficult for the average reader to get hold of, often because, as with a good deal of scholarship on the Heart Sutra, it was published in Japanese. So, in that sense, the book fills a gap in the market. The publisher, Shambhala Publications, are known for publishing fairly serious works alongside mass-market trivia and reviewers seemed to be particularly impressed by the author's "scholarship". However, my own delight at obtaining a copy of this book was soon tempered by misgivings about the quality of the scholarship, particularly with reference to the Sanskrit texts and to aspects of how it treats the sutra's history. The new book was published by Shambala in 2014 as an attractively designed hardback. After the massive disappointment of Red Pine's popular translation and study of the Heart Sutra, this book promised to be a corrective. The sub-title proclaims that it will be a comprehensive guide. This suggestion of comprehensiveness seems to refer to the inclusion of many versions of the text in the discussion section, including several versions in less well known Asian languages. However, it quite quickly becomes apparent that in an English language book on the Heart Sutra there is not much advantage to having a Vietnamese or a Mongolian translation. It makes me wonder who the intended audience was. The crucial versions required for understanding the text and the history of the Heart Sutra are the surviving Sanskrit manuscripts, those used by Conze for his (flawed) critical edition, and the Canonical Chinese texts (T250, T251, and T256) and, in addition to these, the early Prajñāpāramitā texts that the Heart Sutra quotes from, particularly the version in 25,000 lines and its translations into Chinese (esp T223 and T220) and also《大智度論》Dà zhì dù lùn (Sanskrit *Mahāprajñā-pāramitopadeśa) T1509. The last is a commentary, attributed to Nāgārjuna, on the 25,000 line text incorporating the lines that are quoted by the Heart Sutra. 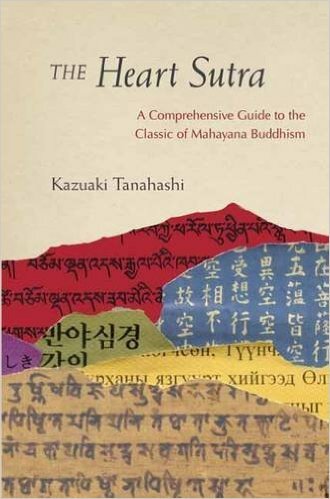 Tanahashi does include most of these versions (leaving out T1509 and T220) and some discussion of the sources of the Heart Sutra; however, rather than producing a critical discussion of the differences between the texts and what that might tell us, the author manages only a superficial comparison of the texts in different languages. His scholarship is more of an exercise in collecting versions and contains almost no critical evaluation of the versions. To make it more confusing, Tanahashi takes the Japanese Horiuzi Palm-leaf manuscript, the Sanskrit version embedded in T256, and the edition produced by Conze as three distinct recensions. Weirdly, he refers to Conze's edition as the "Nepalese Version" despite the fact that Conze used Japanese and Chinese manuscripts and inscriptions, including the Horiuzi manuscript, for his edition. Despite its flaws, Conze's edition is a true critical edition; i.e., an attempt to use the existing manuscripts and inscriptions to reconstruct the text that underlies all of them. The idea of a critical edition seems to be lost on Tanahashi. It is not unusual for Japanese authors to privilege the Horiuzi manuscript, because of its claim to be the oldest manuscript (albeit that it is not as old as is usually claimed). But this manuscript is also riddled with errors and must be seen in the context of the manuscript tradition as a whole. Tanahashi refers to T250 as the "α version", though T250 is clearly no such thing. T250 contains large chunks of text that are not included in any Sanskrit text, for example, making it the least likely candidate amongst the short-text versions to be an ur-text. Part of the problem is that Tanahashi rejects the conclusions of Jan Nattier in her watershed 1992 article in which she spells out the reasons to doubt the author attributions and, therefore, the dating, of both T250 and T251 (usually attributed to Kumārajīva and Xuanzang, respectively). It's apparent that neither T250 nor T251 can be the ur-text for the Heart Sutra. Tanahashi, unlike Red Pine, accepts that the Heart Sutra was composed in China, but he has no explanation for how either T250 or T251 could have been the model for the Sanskrit text as it has come down to us. As it stands, T250 has several more phrases that have no counterpart in any other text, let alone the Sanskrit, than T251 does. This makes it less likely to be the "α version" than any other Chinese text. But then, neither T250 nor T251 precisely corresponds to the Sanskrit version. The ur-text or α version is almost certainly no longer extant and the versions we do have show signs of editing. Tanahashi makes no mention that I can find of T1509, even though it is highly likely to have influenced the final form of the Chinese Heart Sutra, if not having been the actual source of the quotations. Nattier (1992) sets out the evidence for these conclusions in great detail in her article. In many cases, she is simply repeating (with references) the widely held views of her colleagues, though she does make original observations on this subject, as well. So, while it is clear that Tanahashi has made some effort to understand the various versions, the conclusions that he comes to are idiosyncratic and, frankly, misleading. And this is problematic, because of the influence of both author and publisher. We know from history how mistakes can become canonised and propagated because they are associated with authority figures or popular books. Conze's work on the Prajñāpāramitā is a case in point. While we are on the subject of idiosyncrasies, Tanahashi's frequent translation of śūnyatā as "zeroness" (alongside other translations) is deeply problematic. I commented on idiosyncratic translations in my review of Thich Nhat Hanh's new translation of the Heart Sutra. A translator always has difficult choices to make but, rather than being an exercise in self-expression on the part of the author, translation must prioritise the needs of the reader, especially the reader who does not know the source language. When a jargon term has a standard or widely accepted translation, the translators ought to be constrained to follow it, unless there is some good reason not to. In which case they must explain in detail what that reason is and leave plenty of signposts for the reader so that they can join the dots. To my knowledge, no other translator has ever suggested "zeroness" as a translation of śūnyatā and, in my view, it conveys utterly the wrong impression. The new translation of the Heart Sutra featured in the book uses "boundlessness" which says more about modern (Romantic) Zen concerns than it does about the way that Prajñāpāramitā authors saw śūnyatā, i.e., in terms of the absence of svabhāva. The problems of an apposition between a substantive and an abstract noun I noted in my Form is Emptiness essays seems to apply even more in this case: "form is zeroness" looks exactly like nihilism. And it leads to mutant translations such as "(Avalokiteśvara saw five skandhas and) perceived them as zero-like self-nature." [sic] (156 ). On p.157 Tanahashi seems to have become confused by the fact that later on Indian mathematicians used śūnya as a word for "zero", because in this context it clearly refers to absence (of svabhāva), just as it does in some early Buddhist texts. In the book there is no discussion on what the differences between the versions of the text might signify. So the reader is left with multiple conflicting versions of a well-known text without any commentary that might help us make sense of the differences. It's not necessary to argue for a definitive version because there may not ever have been one. But Tanahashi could have spelled out which are the most important versions and tried to explain the significance of the differences between them. For example, what does it mean when one version of a text includes a passage that no other version includes? Textual criticism would usually see such passages as interpolations: chunks of texts that have been added to one version only, and not passed on in other versions. The presence of just such a passage is what disqualifies T250 as the "α version". Tanahashi says that he accepts Nattier's Chinese origins thesis, but if he does accept Nattier's thesis then it does not show in his exegesis. None of the explanations that she provided for some of the back-translations, for example, make it into Tanahashi's exegesis. There are places where it might have been useful, such as the case of 究竟涅槃 or niṣṭhānirvāṇapraptaḥ (Tanahashi 186-7; cf Nattier 1992: 178). This phrase is natural in Chinese, but extremely awkward in Sanskrit. This is a key part of the evidence for the text having been composed in Chinese and then translated into Sanskrit by someone who was unfamiliar with the Sanskrit idioms of Prajñāpāramitā texts. An Indian Buddhist composing in Sanskrit would not come up with this phrase. Nor does it occur in the Prajñāpāramitā literature. If Tanahashi accepts Nattier's thesis, why not make use of the observations that flow from it? On p. 193 he describes mantra as "related to the verb mant". The verbal root is √man, the verb is manyate. The t in mantra comes from the instrumental suffix -tra and the etymology of the word is man-tra, "that which facilitates thought". On p. 156 the author gives a number of elaborate definitions of the verb paśyati, "behold, look at, perceive or notice". This is taken directly from Monier-Williams's Dictionary (MW) where these are the senses in which the word is used in the Ṛgveda (Something beginners often misunderstand is that MW places the older definitions first in each entry). But he has missed out the very first definition, and in this case by far the most apposite definition from MW, i.e., "to see". In practice "see" is the most common sense of the word in general Sanskrit, especially in a Buddhist context - it would be unusual to translate it as anything other than "see". And this is what a non-Sanskrit speaking person needs to know. One cannot just translate from the dictionary, one has to have a feel for how the language is used in practice! On p.153-5 the author has divided the phrase vyavalokayati sma pañcaskandhās tāṃś ca svabhāvaśūnyan paśyati sma in the wrong place, creating a phrase that starts with ca - this is forbidden by Sanskrit grammar (this is very basic Sanskrit). The two phrases are vyavalokayati sma pañcaskandhāṃs ([Avalokiteśvara] examined the five skandhas); and tāṃś ca svabhāvaśūnyan paśyati sma (...and he saw that they lack self-existence). Here the metaphor SEEING IS KNOWING probably applies, i.e., "[he] examined the five skandhas and understood they lacked self-existence." I deal with this sentence in detail in Attwood (2015). These are just examples I have scribbled in the margins of my copy. There are many more. Another problematic area is the commentary on the formula rūpaṃ śūnyatā śūnyataiva rūpam (158-62). Here the author has mixed up the text, misunderstood which bits of the different versions correspond to which, and fluffed the Sanskrit etymologies. The result is a disastrous muddle. There are three pairs of phrases in the Sanskrit Heart Sutra, but only two pairs in the Chinese (T250, T251) and the 25,000 line text in both Chinese and Sanskrit. Tanahashi knows that one of the three pairs is the odd one out, but he chooses the wrong pair so that his commentary is on the pair that is left out, but connected to the pairs that remain. It seems that no one who with a good knowledge of Sanskrit proofread the book. No one fact checked Tanahashi's assertions about the Sanskrit text. No doubt this would have been expensive and added to the cost of the book and lengthened the production process, but the result is rather poor and often misleading. In a book promoted as a comprehensive guide to the most popular Mahāyānist text, you'd think it would merit careful attention. Sadly not. What we have here is another Zen translator attempting to pass himself off as able to translate an important text from Sanskrit without really knowing Sanskrit. And since their peers know even less Sanskrit, the practice can continue because if you pack a book with grammatical jargon and etymologies it looks like you know what you are talking about. Where the book does better is in describing the cultural context of early Medieval China. Though even here it now seems very dated and superficial in the light of Paul Copp's book on the cult of dhāraṇī in early Medieval China (2014). Copp sheds a good deal of light on the Chinese practice of using short texts for inscriptions and manuscripts to avert misfortune and create good fortune. Tanahashi manages to convey that the text was used in this way, but not why. As I mentioned, reviews praise the scholarship of the author. The book's blurb says that the line by line (in fact, phrase by phrase) analysis provides "a deeper understanding of the history and etymology of the elusive words than is generally available to the nonspecialist". Unfortunately, the non-specialist is in no position to evaluate the information being presented to them, either. The dust jacket endorsement attributed to Roshi Pat Enkyo O'Hara declares the books "unsurpassable!" In fact, it could easily be surpassed simply by correcting the many errors. Few non-academics are able to appreciate what good scholarship looks like and thus are unable to see limitations and deficits in this book. An accumulation of detail (often erroneous detail), without any real attempt make sense of it, is not scholarship, it is more like stamp collecting. Scholarship involves the critical evaluation of what one has collected and trying to communicate insights that derive from that evaluation. Tanahashi's book is like a stamp collection. Everything is nicely displayed, but some of the labels are wrong, and there is nothing to say why these particular stamps are important or useful. The book includes a new translation composed with help from Joan Halifax (3-4). Like the translation produced by Thich Nhat Hanh, this one paraphrases the text to try to make it more consistent with modern Zen concerns. The result is another padded out, turgid pseudo-poem. The Heart Sutra itself is not comprehensible without considerable contextualisation (and possibly not even then). As with previous translations this translation fails to see the text as a Prajñāpāramitā text and sees it, instead, in sectarian terms as a Zen text. On one hand, this is not such a bad thing. If one is trying to communicate something to an audience of modern Zen Buddhists, then one uses terms and ideas that they will understand. Commentators (both ancient and modern) typically use the Heart Sutra as a floating signifier to carry a message that is independent of the words and aimed at promoting a sectarian view of Buddhism. In which case, the author would ideally be clear that this is what they were doing. Tanahashi is not clear on this point. The book pretends to be a non-sectarian work that gives the reader a "deeper understanding... of the elusive words", but it fails on two counts: firstly, the information about the words is frequently inaccurate; and, secondly, the commentary is all too often not elucidating the words of the text, but instead expounding the ideology of Zen seen through the lens of Romanticism. In one case the translation mistakes the object of a verb and thus mistranslates. Where the text says that dharmas do not arise or pass away, the author and his co-author translate this as śūnyatā not arising and passing away. This might be doctrinally sound, but it is not what the text says, either in Chinese or Sanskrit. Nor does it say that "Boundlessness is the nature of all things". The Chinese text is 是諸法空相 "All dharmas are marked with emptiness" or sarvadharmāḥ śūnyatālakṣanā. Anyone familiar with Buddhist Chinese will recognise 空相 as the equivalent of Sanskrit śūnyatā-lakṣana. The concept of "nature" has sneaked in here, giving the text an ontological twist, i.e., a speculation about the nature of dharmas, rather than a statement about the observed characteristics of them. The sheer number of such problems makes reading the book an exercise in exasperation for an informed reader. I have written to the publishers to point out some of the many mistakes I have noted above, but without much hope that I can repair the damage done. Shambala have not responded to my emails. In the end the book is very disappointing. I certainly disagree with Zoketsu Norman Fisher when he says on the back cover blurb that "this astonishing work of loving scholarship... is a must-have for any serious Dharma student". It is an astonishing work, but for all the wrong reasons. The best one can say about it, is that it is reasonably priced. It's a real shame that this book falls so very far short of the claims for it. There really is no good book on the Heart Sutra in English and thus another opportunity has been lost to open up the fascinating history of this text to the general public in a meaningful way. People often ask me what book I would recommend and I keep having to say that I cannot recommend any book on the Heart Sutra. Indeed, I find myself warning people not to read books. Don't read Red Pine, for example. Don't read Conze, D T Suzuki, or Mu Seong. Don't, because the books are poorly researched and written. They won't help you understand the text or put the words into practice and they will certainly mislead you in ways that will be difficult to detect if you don't read Sanskrit and (Buddhist) Chinese. I haven't read commentaries by the Dalai Lama or Thich Nhat Hanh, but going on the latter's translation I would not recommend him either. One is probably better off not reading this book, either. It is ironic, given the iconic status of this text, that the best scholarship is ignored and the worst is wildly popular. Donald Lopez's two books (1988, 1996) on the late Indian commentaries preserved in Tibetan certainly offer some insights, but those commentaries are sectarian and rather difficult to understand and interpret. Similarly with more recent translations of the earlier Chinese commentaries by Xuanzang's students Woncheuk and Kuījī (Hyun Choo 2006, Shih & Lusthaus 2006). The best one can do at this stage is read Jan Nattier's 1992 article (being sure to read all of the footnotes carefully), and Paul Copp's (2014) book on dhāraṇī. This at least opens some doors and gives one a sense that the popular view of the text does not hold water. I've written nearly 30 essays on the Heart Sutra and related texts covering certain details of the text, but a truly comprehensive, critical study of the Heart Sutra in its own right as a Prajñāpāramitā text, sadly does not yet exist. Quite surprising given the manifest popularity of the text. Copp, Paul. (2014) The Body Incantatory: Spells and the Ritual Imagination in Medieval Chinese Buddhism. Columbia University Press. Hyun Choo, B. (2006) 'An English Translation of the Banya paramilda simgyeong chan: Wonch'uk's Commentary on the Heart Sūtra (Prajñāpāramitā-hṛdaya-sūtra)'. International Journal of Buddhist Thought & Culture, 6: 121-205. Lopez, Donald S. (1988). The Heart Sūtra Explained: Indian and Tibetan Commentaries. State University of New York Press. Lopez, Donald S. (1996). Elaborations on Emptiness: Uses of the Heart Sutra. Princeton University Press. Shih, Heng-Ching & Lusthaus, Dan. (2006). A Comprehensive Commentary on the Heart Sutra (Prajnaparamita-hyrdaya-sutra). Numata Center for Buddhist Translation & Research. Philosophers and physicists seem to fall out in public quite often these days. See, for example, Goldhill (2016) for a typical complaint about facile arguments from prominent physicists on the subject of philosophy. Physicists seem to take a perverse delight in dismissing philosophy out of hand, but often show their deep ignorance in the process. Stephen Hawking infamously declared philosophy dead. Paraphrasing Goldhill, this is a very stupid thing for a very smart person to say. Which just goes to show that smart people do make mistakes and do say stupid things. We can't just abdicate the responsibility for evaluating what people say, even when they are experts. As Richard Feynman said, "science is the belief in the ignorance of experts". And if we are not in a position to judge, then we can always seek out those who are and get their opinion. Unfortunately, physicists are often seen as authorities and thus their views on philosophy are widely taken seriously, even when they are out of their depth and saying stupid things. In this essay, sparked by a blog by Deric's MindBlog, I will outline Libet's findings, explore some responses from other scholars, and look at the philosophical implications. We might not be able to put to rest the wailing of "there is no free will" by Determinists, but we can at least give them something to chew on for a while. Libet was investigating the phenomenon of readiness potential (RP). The RP is a slowish build up of electrical potential in the brain, measured at the scalp over the motor cortex by an electroencephalograph (EEG). It occurs a second or more before people make voluntary movements. As the name suggests, this build up of electric potential was assumed to be the brain "getting ready" to initiate a movement. Libet was interested in the timing of the RP and the decision to move. Libet's classic experiments (Libet 1985, Libet et al. 1983) asked people to make a simple movement, usually flexing their hand or wrist. The subjects were instructed to move whenever they felt like it (within a 20 sec window). At the same time they observed the position of a spot moving in a circle on an oscilloscope screen and reported the position of the spot when they felt the "urge to move". What he found was that there was a delay of some 200 milliseconds (ms) between becoming consciously aware of an urge to move and the actual movement. However, the readiness potential began to build up 350-500 ms earlier. Note, this is a very short-range phenomenon. The voltage measured on the scalp is in the order of a few micro-volts (10-6 V). The amplitude drops off sharply. Another few centimetres from the scalp and the electrical activity would be undetectable (so no, this is not a mechanism for telepathy!). Indeed, one of the drawbacks of EEG for measuring brain activity is that it doesn't detect electrical activity below the cortex layer. The technique is also poor at localising the activity - multiple electrodes and sophisticated analysis of the activity can improve this, but EEG is still a pretty blunt instrument. The technique is famous for the early discovery that the activity in the cortex occurs in waves. Libet controversially interpreted the initiation of the readiness potential as the "decision" to move, the point where the brain unconsciously began preparing to move. Becoming conscious of an "urge to move" came significantly later, and then, finally, the action itself was initiated, the whole process taking almost half a second. In this interpretation, the experience of willing our hand to move comes quite a long time after the brain has decided to move. In other words, the experience of willing our hand to move is a secondary feature in the process. Hence, freewill, interpreted as contra-causal freewill, is not what initiates a voluntary movement. I was alerted to idea of contra-causal freewill by reading Patricia Churchland's book Touching A Nerve: The Self as Brain (2013) in which she argues against it. Contra-causal freewill is the idea that we have an abstract capacity called "will" that is like the executive branch of the abstract capacity of "reason". To be considered contra-causally free, this capacity to make decisions or initiate actions must be free from any influences other than itself. Specifically, emotions, motivations, desires, goals, and knowledge must be excluded as potential influences. If any of these influence our decision making then, in this view, our will is not free. Thus for Libet, if some unconscious part of the brain is making the decision to move and then placing the idea in our conscious minds, then even though our brain is still making a decision, it does not count as free will because it is not based on the abstract reasoning capacity. Any long time readers of this blog will know that this definition of free will is suspect at best. There are two main problems with it. Firstly, the definition makes an egregious mistake in considering reason to be an abstract capacity. I follow Lakoff and Johnson in taking reason to be a function of an embodied mind. Reasoning specifically uses metaphors grounded in our experience of the world to enable abstraction. It is not that we have an abstract capacity for reason, but that we have an embodied capacity for abstraction. Research by Antonio and Hannah Damasio (amongst others) has shown that emotions are involved in all decision making. As I have explained it, emotions tell us how salient any fact is to our decision making process (see Facts and Feelings, 25 may 2012). There is simply no plausible way for contra-causal freewill to operate. Secondly, the definition involved legacy understandings of how reasoning works. I also follow Mercier and Sperber in seeing reasoning as an argumentative capacity. It is well known that individuals are generally very poor at reasoning tasks. Most of us do not to make rational decisions and when we try to, we almost inevitably fall into cognitive bias or logical fallacy. On individual tests of reasoning, we frequently score worse than random guessing. The long lists of cognitive biases and common logical fallacies that we are prone to bear stark witness to this. Reasoning is not activated until we are assessing someone else's argument or retrospectively justifying our own actions (see An Argumentative Theory of Reason, 10 May 2013). As Churchland has said, contra-causal freewill is not particularly interesting. Even if the experiment showed that we do not have contra-causal freewill, this would still not be interesting as the concept is a legacy of a bygone era that has no place in modern discussions about the mind or morality. Clearly, many scientists are poorly informed on developments in philosophy because they think philosophy is worthless. They cannot be relied on, in general, to be guides to the philosophy of freewill. This is an important caveat when considering this question. My suspicion is that the criticism cuts both ways. That as much as philosophers like to comment on science, they are often too poorly informed about it to be trustworthy guides to it. All too many philosophers in this field seem to be ontological dualists who do not believe that studying neurons can tell us how the mind works, for example. Sorting out whether or not any individual commentator on this issue makes sense is really quite difficult. No doubt I am also a poor guide to this issue. However, other scholars have been trying to reproduce Libet's experiments and assessing his interpretation of the results since it was published. And we can turn to them to get some balance. As I say, the interpretation of Libet's experiments has been the subject of intense controversy since they were first published. It seems, from my outsider point-of-view, as though physicists have lined up to say that they prove that human beings are Deterministic and that there is no freewill. But even casually reading around this subject we see that philosophers have lined up to deny that Libet tells us anything about freewill. For example, what exactly is a voluntary movement? Peter Clarke (2013), for example, cites the example of a tennis player serving a ball. The decision to serve may be voluntary and the movement of the arm might even be partially under conscious control, but the myriad movements that coordinate the whole body as it moves and balances to support the motion of serving are almost entirely unconscious. The motions that direct the ball to the precise location on the opposite player's court are mostly not under the direct control of the player. Tennis players have developed a kind of reflex that allows them to serve accurately at speeds that does not require conscious thought. Indeed, in many sports, we know that thinking too much about key muscle movements is counter-productive. So, is serving the ball a voluntary act? I get this playing the guitar. I train my fingers to find and pluck the notes I want so that I don't have to think about them and this enables me to sing at the same time. If I was consciously seeking out notes on the fretboard and dredging up lyrics and all the other components of articulation and delivery, I could not play the simplest tune, let alone something as complex as, say, the Beatles' tune Blackbird. The assumption that a decision to act cannot occur without being conscious of it is deeply problematic. In playing a tune like Blackbird, I initiate hundreds of actions with no consciousness of doing so because my attention is usually elsewhere. So this question is far from trivial and it ought to make us pause before considering what it means for an experimental subject to make a "voluntary movement". Even if Libet relies on a single movement, how do we know that this is representative, or that the experiment is able to isolate that movement from everything else that is going on in a conscious subject? An important criticism of the Libet experiment is that it is very difficult to judge when one experiences the "urge to move". Clarke (2013) did the experiment himself and commented "When I try this, I find it very hard to judge the precise time when I decided to move my finger / wrist." Clarke describes studies on the reliability of the subjective timing of events which have shown it to be very imprecise. Additionally, the experiment involves an attention shift from the movement to the timing that "may have introduced temporal mismatches between the felt experience of will and the perceived position of the clock hand." Attempts to eliminate this mismatch have shown that the RP occurred before the "urge to move" only in about two thirds of subjects. To try to improve accuracy, the experiment was performed using functional magnetic resonance imaging (fMRI) and this also showed that "the activity of prefrontal and parietal cortex was correlated with the decision [to move] with 60% prediction accuracy, up to 10 sec before the conscious decision." These findings seem to say that there cannot be a causal relationship between the RP and the "urge to move", else it would occur every time. In which case Libet appears to have misinterpreted what the RP is. Clarke (2013) lists a number of other published criticisms of the Libet experiments. Firstly, Libet takes the RP to represent a decision to move; i.e., he believes that there is a causal connection between the beginning of the RP and the action, if and when it comes. However, it appears that there is no neural connection between the areas that build up potential in the RP (the sensory motor-cortex) and the parts of the brain associated with decision making (in the parietal lobe). Thus, in addition to there being a disconnect in practice, there is no obvious mechanism for the RP to cause the urge to move, either. 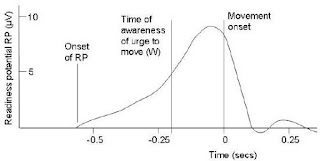 Secondly, if the RP was the cause of the movement, then we would expect a strong correlation between the timing of the onset of RP and the timing of the urge to move. But this correlation does not occur. Experiments to test this seem to rule out the RP as cause of the urge to move, though not of the movement itself. So, at the very least, the mechanism proposed by Libet has a missing link. And that link might play an active role in the process (i.e., might be directly causal). Alfred Mele offers a third criticism of the Libet experimental set up, noted by Clarke (2013). In Libet's experiments, the data was only stored when a movement is initiated. Libet collected no data on what happened if the subject decided not to move. This vitiates his finding because it's entirely possible to prepare to move, which would presumably initiate an RP, and then not experience the urge to move. If an RP can exist and not give rise to an urge to move, then RP may not related to the urge to move at all. This possibility ought to have been excluded, but was not. A variation on the experiment by Trevena and Miller did collect data on cases where the decision was made not to move. The RP was the same whether they moved or not. And this suggests that RP does exist without giving rise to the urge to move, or an action, which undermines Libet's conclusion that RP represents a decision to move. A fourth weakness was pointed out by Hermann, et al. They set the experiment up as a decision to press one of two buttons in response to a stimulus. They also found the RP appearing before the urge to move occurred, but the RP occurred even before the stimulus appeared and thus is unlikely to have been related to a decision about which button to press. Again, the evidence points away from a coupling of RP and the urge to move. In fact, Schurger, et al (2012) showed the decision to move occurs very late in the course of the RP, not at the initiation of it. Libet himself argued that his interpretation showed that, although freewill in the sense of consciously initiating actions was ruled out, we still had the option of inhibiting actions between the initiation of the RP (what he called the decision to move) and the urge to move. Some people called this "free-won't". This might be an interesting thread to follow up, except that considering the various critiques of Libet's experiment and interpretation, it seems that treating the initiation of the RP as the decision point makes no sense. "In particular, when actions are initiated spontaneously, rather than in response to a sensory cue, the process of integration to bound is dominated by ongoing stochastic fluctuations in neural activity that influence the precise moment at which the decision threshold is reached. ... This, in turn, gives the natural but erroneous impression of a goal-directed brain process corresponding to the ‘cerebral initiation of a spontaneous voluntary act’"
In other words, if we look again at the graph of "readiness potential" the decision to move comes at the peak of neuronal activity not at the onset of the RP. The RP is an accumulation of more or less random neuronal activity. This would explain some of the contradictory results mentioned above. But, crucially, what this suggests to me is that the urge to move precedes the decision to move. The urge to move may, in fact, be an important factor in the decision to move. So it seems that Libet's interpretation of his experiment was flawed in these various ways and that freewill is back on the menu. I discovered this information because I happen to read a number of neuroscience blogs and Twitter feeds and one of them happened to mention this new article by Shurger et al. (2016) which drew me into the subject anew. But there was always debate. Over what freewill means. Over what the readiness potential represents. 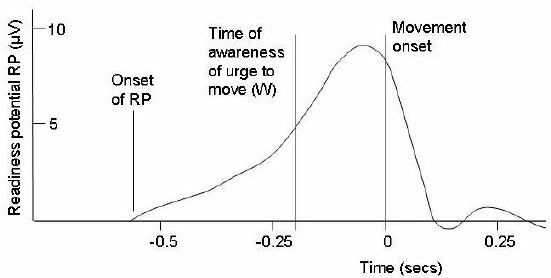 Over the causal relationship between the readiness potential and the urge to move; or between the RP and the actual movement. Over Libet's experimental methods. This experiment is so often presented with a one-sided interpretation, with no mention of the mass of contradictory evidence that make Libet's interpretation look doubtful. There is no mention of the intense debate that has ensued. Any reader could be forgiven for thinking that it was an open and shut case or that Libet had definitively shown that freewill could not exist. But this was never the case. The interpretation of the experiment could never be considered unequivocal proof of anything. The weakness of Libet's experimental design and the many contra-indications for Libet's interpretation of the readiness potential as a decision or even as causal, ought to have been given more prominence in the discussion of freewill. Most scientists are aware of the problem with "proving" an hypothesis anyway. As Karl Popper observed, an hypothesis can really only be disproved or a conjecture refuted. A scientific theory may make more or less accurate predictions. For example, the Higgs Boson has not in fact been proved to exist. However, the theory (The Standard Model of Particle Physics) did predict a particle would be found in a certain energy range and such a particle was found in the Large Hadron Collider. So the theory survives another test, and we now try to test other predictions that it makes. The theory could fail at any point, and many scientists hope that it does, because that would make their work far more interesting and open up the field to new discoveries. The failure of the Standard Model would initiate a golden age of inquiry into the nature of the universe. Scientists are frankly bored by the idea that everything has been discovered. Which is the opposite of how they are sometimes portrayed and the opposite of religious approaches to knowledge. When so-called scientists give a biased presentation of an issue, citing only the evidence for their interpretation and avoiding even mentioning that there is considerable evidence against it, then that is a kind of fraud. Scientists committing such fraud ought to be censured by their peers. False statements ought to be retracted. And I think in this area of freewill many scientists are guilty of this kind of fraud. And many laypeople have repeated the fraudulent claims and perpetuated a falsehood. In this the public have been extremely badly served by lazy journalists who have simply failed to report the experimental evidence. Whether this also amounts to fraud depends on your point of view. I see the primary function of journalism as being entertainment. Entertainers are always allowed some "poetic licence" to deceive us about facts if the version of events they present is more entertaining than reality. Hollywood films almost always distort history because the real story is often boring. Science journalists are a mixed bag and you never know which kind of story you are reading, but these days I just assume, with very few exceptions, that if a journalist is writing they are seeking to entertain rather than inform. There will be those who cite this case as showing that the scientific method is broken. That in overturning a previous interpretation of the data science has proved that it cannot be trusted. To my mind, it says completely the opposite. This is science in action. This is the scientific process at work. The overturning of previous interpretations is part and parcel of embracing science. What we think we knew today is quite likely to be overturned tomorrow. For the religieux seeking certain knowledge and believing that they have found it, this seems anathema. That knowledge could be transient and contingent makes it seem untrustworthy. Religion is predicated on the idea of absolute knowledge, from which comes certainty, and relaxation, as all mysteries are resolved in the long run. But that is an impossible fantasy. In the real world, things are messy. Knowledge is never absolute. There is always the possibility of being wrong. Religieux seem very uneasy with the idea that they might be wrong. Buddhists, in particular, seem to find this concept deeply troubling. Scientists, by contrast, embrace uncertainty and the principle that all knowledge may be overturned by a better explanation. Science progresses by testing ideas to destruction. This attitude of contingency with respect to knowledge of the world is, in fact, far more in keeping with Buddhist ideology. Most Buddhists appear to believe that the world can be understood in absolute terms, that the Buddha was omniscient in this sense, and that the Dharma is an expression of this absolute knowledge, i.e., that it represents absolute truth. They further believe that we can come to this absolute knowledge through introspection and believe that we cannot come to knowledge through examining the world. I have been told by a colleague, for example, that "no amount of study of the brain will ever tell us anything about the mind". Which is just Cartesian Dualism, as far as I can see, and thus a thesis that has already been soundly refuted. However, despite having cast considerable doubt on the Libet interpretation, this is not the end of the story. There are other arguments against free will that are much more difficult to tackle than Libet's and his Determinist fans, for example, the argument by Sabine Hossenfelder on the Backreaction blog. I don't necessarily agree that arguments from fundamental laws eliminate the possibility of unexpected emergent properties that are indistinguishable from free will, but she still makes a strong argument for anyone who acknowledges the laws of physics. And so the arguments will go on. But as religieux we do need to be wary of pursuing a conjecture only because it supports our doctrine. Freewill is interesting because without it Buddhist ethics would be meaningless. If we seek only to bolster our view, rather than to seek the truth, then the possibility of being wrong is excluded and we are unlikely to accept that we have been wrong when the evidence becomes unequivocal. I see this happening in the area of the afterlife, for example. Intelligent people must always hold to the possibility of being wrong. But intelligent people are also the most reluctant to reconsider their considered views. Intelligent religious people are the worst. Churchland, P. S. (2013) Touching A Nerve: The Self as Brain. W. W. Norton & Co.
Fried, I., Mukamel, R. & Kreiman, G. ‘Internally generated preactivation of single neurons in human medial frontal cortex predicts volition’, Neuron (2011) 69: 548-562.
action. Behavioral and Brain Sciences, 8: 529-566.
act in relation to onset of cerebral activity (Readiness-Potential), Brain, 106: 623-42. Schurger, A. et al. (2016) Neural Antecedents of Spontaneous Voluntary Movement: A New Perspective. Trends in Cognitive Sciences, 20 (2), 77 - 79. "The general result is that neuroscience and psychology could in principle undermine libertarian free will, but that Libet-style experiments have not done that so far." I've written close to thirty essays on the Heart Sutra since I read Jan Nattier's 1992 article and attempted to précis it. In rediscovering this text that I've known for more than twenty years, through studying the manuscripts and Chinese canonical versions, I have very seldom been tempted to write about modern English translations or commentaries. The translations are mostly awful and the commentaries all about what the exegete wants the sutra to say, not about the sutra itself. This essay is, however, about a modern translation that is also to some extent a commentary. 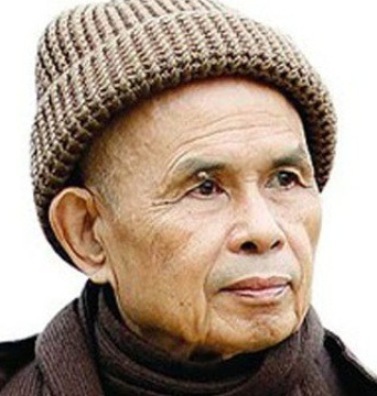 In 2014, the popular Zen priest, Thích Nhất Hạnh (TNH), produced a new translation of the Heart Sutra. You can see it alongside the previous, more standard translation, here. Whenever someone like him does something like this, the result is usually greeted with a wave of sycophantic over-praising (the same happens in my own Buddhist movement). TNH's own website refers to the translation as "profound and beautiful". This is really not true. Only a disciple of the man, suffering from lack of perspective, would say this. To an outsider, the new translation looks turgid and peculiar. In some ways this is no surprise, because the Heart Sutra is tightly packed Buddhist jargon that doesn't translate easily. See also David Chapman's content analysis of the Heart Sutra. A lot of new translations are motivated by vanity or a desire to establish one's credentials as a "Zen master". They add nothing to our knowledge of the text, and make no contribution to the field of literature, either. They are usually the worst kind of Buddhist Hybrid English. For example, many translators, TNH included, try to imply that the Heart Sutra is in verse by laying it out like a poem. The Heart Sutra is not in verse. It's not a poem. The Heart Sutra is prose. In fact, there is only one Prajñāpāramitā text in verse and that is the bridesmaid of the genre, Ratnaguṇasaṃcayagāthā (not even translated into Chinese until the 10th century). "The reason [TNH] must retranslate the Heart Sutra is because the patriarch who originally recorded the Heart Sutra was not sufficiently skilful enough with his use of language. For this reason, it has caused much misunderstanding for almost 2,000 years." Of course, the Heart Sutra is nowhere near 2000 years old, it is perhaps 1300 years old. Obviously, TNH is either unfamiliar with, or rejects, Jan Nattier's Chinese origins thesis, which by contrast I take to be established beyond reasonable doubt. The single most important piece of modern scholarship on the Heart Sutra has yet to penetrate Plum Village. The idea that a "patriarch" recorded it badly is certainly novel and we could dwell on this idea of a perfect sutra, imperfectly recorded, but I want to move on to the main point. The problem according to TNH is that there is a contradiction in the Heart Sutra. I independently identified this contradiction only recently and given the Buddhist establishment's reaction to any suggestion of imperfection in their scriptures I was both surprised and intrigued to find TNH fessing up, albeit via a spokesperson. So what is the problem? "...the mistake doesn't rest in the formula, 'form is emptiness'; rather, it resides in the unskillfulness of the line, 'Therefore in emptiness there is no form.' "
The trouble is that the two statements are contradictory in a way that cannot be swept under the carpet as some kind of paradoxical crypto-wisdom. If one is saying that "emptiness is form" in one breath and in the next saying "in emptiness there is no form", then that is not paradoxical, it is simply contradictory. As TNH says: "This line of the sutra can lead to many damaging misunderstandings." So all credit to TNH. He's found a(nother) mistake in the Heart Sutra and gone public about it. Buddhists are typically strongly averse to admitting such things. We really ought to pause and allow this to sink in before considering what TNH did in response to this discovery. While it is radical of TNH to admit finding a mistake in a Buddhist text, his response is an anticlimax. He characterises the problem as an imperfect recording of the text by some ancient "patriarch" and, in response, changes the wording of the text so that the problem simply disappears. TNH appears to believe he has insight into the intended meaning and the ability to correct the wording to convey this. Now, TNH likes to cite the Sanskrit text, because he still believes that this is the original, most authentic version of the text. As I say, he appears to reject the Chinese origins thesis. But, as I will show, he is, in fact, translating from Chinese and only citing Sanskrit in order to add gravitas to his words. (Compare Nattier's comments on which Mahāyāna texts have become popular in the WEIRD world). It seems a bit disingenuous, but appears to be standard procedure in the world of Zen translations. There are two things to say about this. Firstly TNH has inverted the order of these pairs of statements from the Chinese text of T251 (the best known version of the Chinese text, attributed to Xuanzang). Judging by other features of his translation, TNH is apparently translating from the Chinese, but here he has used the order found in the Sanskrit Heart Sutra. The order in T251 reflects the order in the source text T233, Kumārajīva's translation of the Pañcaviṃśatisāhasrikā-prajñāpāramitā-sūtra, which, in turn, reflects the word order in the Sanskrit version of that text in surviving manuscripts. So, in fact, T251 is the more authentic version of this passage and the Sanskrit Heart Sutra is the odd one out. It is not necessarily more authentic to adopt the reading from the Sanskrit, especially when one is translating from Chinese. The second thing to say is that translating rūpa as "body" in the context of the five skandhas is peculiar. It is normally taken to mean "form" as a representative of the kinds of objects with which the sense faculties can collide to produce experience. The Heart Sutra itself spells this out when it places form alongside sounds, smells, tastes, tangibles and mental objects (dharmas). And "form" is what was originally used by TNH. It's not clear why he now translates this as "body". Sue Hamilton does suggest that rūpa refers to the "locus of experience", but this is a bit more complex than just "body". TNH seems to depart from the mainstream in this choice for reasons that are far from clear. What the Sanskrit text says is Tasmāc chāriputra śūnyatāyām na rūpam... i.e., "Therefore, Śāriputra, in emptiness there is no form, etc" or "with respect to emptiness there is no form". The Sanskrit word for "emptiness" (śūnyatā) is in the locative singular case (śūnyatāyām) and can be read either as "in emptiness" or "with respect to emptiness". In either case, it is saying that there is no relationship between form and emptiness, whereas the earlier line states that the two are identical. A flat contradiction. TNH gets around this by changing the text so that it now says that the skandhas are not separate entities. This is by no means bad doctrine, from a Mahāyānist point of view, but it is also not what the text says. So TNH's "translation" is something that he has made up to solve an apparent problem (a post hoc rationalisation). I find it fascinating that TNH feels he is able to change the text to resolve this conflict. It is, by far, the most interesting detail across the whole modern fascination with this text that I know of, and perhaps the only one worth writing about. Apparently, when sutras don't make sense, we can simply change them! Most commentators fail to even notice the contradiction, so they are not interesting at all. However, having stepped into the light, TNH fails to live up to his promise because he immediately sweeps the problem under the carpet. But at least he has acknowledged that there was a problem. Illusion is not one thing and form another. Form is only illusion. Illusion is only form. This is a reference to an old Buddhist simile, that form is like an illusion. The simile becomes a metaphor: form is illusion. And the metaphor is reified to "form is an illusion". The problem is that the editor who substituted śūnyatā for māyā made a grammatical blunder. The form of this statement in the Heart Sutra simply doesn't make sense: it's bad grammar and it has broken a perfectly good metaphor. There are other examples of poor editing in the Heart Sutra that I detail in Part III of my essay Form is Emptiness. So, my argument is that, if there is a problem in the Heart Sutra, it is with this part. The fact is that that statement "form is emptiness, emptiness only form" is nonsense. This does not take away that fact that the statement has symbolised something important for Buddhists for many centuries. Many Buddhists felt, and still feel, that what they were trying to do was inconceivable (literally beyond the conception of the unawakened mind). And as Mahāyānism became more and more theistic, mystical, and magical, it served Mahāyānists to embrace paradox as an expression of this inconceivable goal. And the formula, being paradoxical, gave scope to exegetes of all schools who could claim to understand and interpret this phrase for the rest of us. Though, of course, ultimately, we have to have insight to understand it. I no longer see this line of reasoning as useful or meaningful. Contra TNH, I take the second phrase with śūnyatāyām to be a reference to śūnyatāvihāra or śūnyatāsamādhi, i.e., a (meditative) state of emptiness, described in the Pāḷi Suttas (MN 121, 122) as one in which no experiences arise. The skandhas are the processes by which experience arises. In the state of emptiness these processes seem to be suspended. In emptiness, therefore, there is literally no rūpa, no vedanā, no saṃjñā, no saṃskāra, and no vijñāna. There's no paradox here. It is a simple description of a meditative state. And note that if rūpa meant "body", then the traditional interpretation would suggest that the body disappears in śūnyatāvihāra. Of course, from the point of view of the meditator their body does disappear. But this is not an objective fact. The meditator in emptiness has no way of stepping outside the experience to be objective, because "outside" and "inside" cease to have any meaning in samādhi. So, my solution to the problem is very different to that proposed by TNH. I take "form is emptiness" to be nonsense created by a zealot who mindlessly mangled a perfectly good simile that can be found intact in the Aṣṭasāhasrikā. And I take "in emptiness there is no form" to be descriptive of what goes on in the (meditative) state of emptiness. This is unconventional, since most commentators find little connection between the Pāḷi word suññatā, which usually means something like "absence", as in the absence of experience, while the Sanskrit word śūnyatā is a quality ascribed to dharmas, e.g., sarvadharmāḥ śūnyatālakṣaṇā, "all dharmas are characterised by emptiness", though it can also refer to the absence of essence or svabhāva. I suspect that allegiances will play a major role in deciding what facts are most salient to this issue, and that this will determine which solution sounds more plausible. Since I'm looking at this translation, I want to make a few more comments on it. I will focus particularly on the first paragraph. This is the part of the text I know best and is the subject of my published article on the Heart Sutra (Attwood 2015). The problems evident in this brief section will illustrate my wider point about the value of this translation as doctrine and as literature. This is what TNH came up with for a translation. There is much that is awful about this. Like the other recent Zen inspired "translations" the method seems to be to spell out in phrases what is meant by words and pad out the text, thus making it rather turgid. It turns the text into a kind of commentary. The layout hints at free verse (short lines without rhyme or meter), however, as I say, the Heart sutra is not a poem. It's a short extract from a longer work in prose. The Heart Sutra is simply impenetrable to someone who is not versed in the context. Even some aficionados do little more than wallow in their confusion with regard to this text. No translation that is faithful to the source text is going to be easily comprehensible. The sutra is mostly jargon. Padding it out with expository phrases that are themselves jargon, is not going to improve the situation and makes for rather turgid prose (or pseudo-verse, or whatever). I said that this translation is primarily from the Chinese. How do I know? Because no Sanskrit witness to the Heart Sutra in manuscript or inscription, nor any Sanskrit Prajñāpāramitā text, has an equivalent of the phrase 度一切苦厄 "overcame all suffering". It breaks down as: 度 "overcome" (sometimes used to translate pāramitā); 一切 "all", 苦厄 duḥkhatā or states of suffering. The inclusion of this phrase tells us that TNH was looking at the Chinese text. The other hint of this can be seen later in his translation in the phrase, the "most illuminating mantra". Which is an interpretation of 大明咒. The Sanskrit has vidyāmantra, which cannot be interpreted in the same way. I have blogged on how the Sanskrit Prajñāpāramitā parallels of this phrase all have vidyā translated (by Kumārajīva) as 明咒 (See Roots of the Heart Sutra 15 Aug 2014). Later, when Buddhists had taken up the use of mantras, it seemed more natural to take the two characters as two words "shining mantra". This is further evidence in support of the Chinese origins thesis - the discrepancy is difficult to explain any other way. The phrase "the Insight that Brings Us to the Other Shore", with its strange use of capitalisation, is TNH's translation of the Chinese 般若波羅蜜多 or Sanskrit prajñāpāramitā. There is much for which we can castigate Conze, but in this case, "perfection of wisdom" is adequate and has the advantage of being widely used and understood. Prajñā doesn't mean "insight". In most English speaking Buddhist circles, "insight" is used to translate vipaśyanā. Prajñā is then the product of insight. Choosing an idiosyncratic translation when there is a widely used and accepted translation is usually a bad choice for a translator, because it places a burden on the reader. A weird phrase like "the Insight that Brings Us to the Other Shore" only makes a text worse, because now the reader has to parse this strange phrase and pause to consider what it might mean. Likely as not, we end up translating it back into something familiar. As I've said, this is not a text that one can make accessible to non-specialists using long expository phrases in place of jargon terms. One is condemned to spend years learning to understand the jargon or remaining ignorant. In the latter case, one most likely resorts to the magical thinking that characterised the original milieu of the Heart Sutra and is often the modern response to a confusing text. The first part of the text in Chinese reads: 觀自在菩薩 行 深 般若波羅蜜多時 It we break down we see: 觀自在 Avalokiteśvara 菩薩 bodhisatva 行 practice 深 deep 般若波羅蜜多 prajñāpāramitā. The particle 時 on the end suggest that this is an ongoing action and we usually translate it as "while" or "when". TNH reads 深 as an adverb of 行 "practicing deeply" [with American spelling] whereas most translators understand 深 as an adjective of prajñāpāramitā. That is, it is the prajñāpāramitā that is deep (gambhīra), rather than the practice. Typically, in Middle-Chinese we would expect an adverb to be placed immediately before a verb that it modified (so say my grammar books). In this case, the character 深 comes immediately after 行. So reading it as an adverb is doubtful. The Sanskrit is: gambhīrāṃ prajñāpāramitācaryāṃ caramāṇo. Here gambhīra is clearly an adjective, but it does seem to apply to carya 'practice', i.e., the deep practice of perfection of wisdom. In fact, it appears to be an adjective in the Chinese, as well, though an adjective of 般若波羅蜜多 or prajñāpāramitā. As a point of English grammar, an adverb also usually precedes the verb it modifies, so "practising deeply" ought to be "deeply practising", but this is subordinate to the observation that here "deep" is unlikely to be an adverb. THN has interpolated that Avalokiteśvara is not "practising the deep prajñāpāramitā", but he is "practising deeply with prajñāpāramitā". So he's arguing that prajñāpāramitā, itself, is not a practice, but a substantive, and that Avalokiteśvara has it. The Sanskrit contradicts this with prajñāpāramitācaryāṃ, 'the practice of perfection of wisdom'. TNHs translation appears to be incorrect. According to TNH, Avalokiteśvara, a Bodhisattva, is "practising with prajñā-pāramitā". Weirdly, THN then inserts another adverb "suddenly" that has no counterpart in any version of the text in Chinese or Sanskrit. Avalokiteśvara "suddenly discovered that that all of the five Skandhas are equally empty". But Avalokiteśvara is a fully formed bodhisatva, "with prajñāpāramitā", and is thus quite conversant with the emptiness of the skandhas. It's not something that a bodhisatva like Avalokiteśvara can "suddenly discover", because part of being a bodhisatva with prajñāpāramitā is that he already knows it. So this would seem to be quite a serious error in understanding what is going on. Either Avalokiteśvara is a bodhisatva, or he "suddenly discovered that that all of the five Skandhas are equally empty", but not both. Nor does either the Chinese or the Sanskrit allow for the verb to be "discover". The former has 照見 which I will discuss in the next paragraph, while the latter has paśyati sma "he saw". "照見 zhàojiàn, a difficult term corresponding probably to vyavalokayati sma, but incorporating paśyati sma, i.e., both looking and seeing. 照 can also have a sense of “reflecting”, or “illuminating”, or perhaps “comparing”; while 見 just means “to see”; and on its own would usually correspond directly to paśyati. The two characters can be read like a verbal compound “illuminate and see”, or 照 can be adverbial, giving meanings of the type “clearly see, distinguish”. In Yu (2000) several experts in Chinese literature with varying knowledge of Buddhology approach the Hṛdaya as literature and are split on how to interpret this phrase. Stephen F. Teiser (Yu 2000: 113) translates 照見 as “illuminating vision” (照 as an adverb), while Stephen H West (116) opts for “Shining upon and making manifest” (照見 as a verbal compound). Michael A, Fuller does not translate, but expresses the ambiguity: “I encounter a metaphor when it would have been simpler not to have one: why zhao [i.e. 照]? What is the lore here? Does the wisdom emit light? That is, is such wisdom an active use of the mind that engages the phenomena of the world, or is it simply receptive?" So in this case the position of 照 immediately before 見 does allow it to be read as an adverb. The problem is that 照 doesn't mean "suddenly" and 見 doesn't mean "discover". So again, TNH has not simply translated the text, he has changed it. Next TNH translates 五蘊皆空 as "all of the five Skandhas are equally empty". Again this is problematic. 皆 is, in fact, an adverb meaning "all, the whole, each, every" and the phrase means "the five skandhas are all empty" or less likely "all the five skandhas are empty". So we most likely do read the character 皆 as an adverb, but it's not the adverb he was looking for. It's quite meaningless to add the "equally" to the phrase "all the five skandhas are empty". Emptiness is not a question of degrees. If something is empty, then it is empty. The slightest presence means it is not empty. Lastly, TNH translates 度一切苦厄 as "he overcame all Ill-being". I was surprised to find that "Ill-being" is a word at all. It is an Americanism (it's in the Merriam-Webster Dictionary, but not in the Oxford). I suppose we cannot complain about Americanisms when the bulk of a man's followers are American. But to me this is an ugly expression. Aesthetics are in the eye of the beholder, but most of the rest of this paragraph is so badly translated that it is at least worth pointing out that an obscure term like "ill-being" is just as bad as a Buddhist jargon word for the reader. It still makes them stop to comprehend the word. So many problems in such a short passage. Almost every phrase is mangled in some way. What TNH has done here is not so much a translation as it is a paraphrase of the text. As someone familiar with the text in Sanskrit and Chinese my opinion is that he has not done anything to clarify the text and, in many cases, he has made it less clear, either through an incorrect translation, an unhelpful interpolation, or just poor English grammar. Where TNH may have succeeded is in clarifying what TNH thinks the text means. Which is fair enough, it's just that he's wrong about what the text says. I could go on to critique the rest of the translation, but I think the point is made and I don't want to labour the point. There's nothing profound or beautiful about this translation. It's awful on many levels. While having little literary merit and despite positively obscuring the underlying text, Thich Nhat Hanh's new translation is none-the-less interesting for the boldness with which the man changes the text in response to perceived problems. And this in a world where most new translations are vanity projects which paraphrase without adding anything. Some of TNH's changes are trivial, such as padding out the text with extra adverbs, or turning a word into a long expository phrase so it conveys the views of the expositor, but in dealing with the problem of the two conflicting statements TNH has attempted to make a more substantial contribution. Not only this, but he has had to weigh up the merits of the conflicting statements and choose between them. Since the Heart Sutra is a product of generations of just such interference with written texts, it is interesting to see this process continuing in the present. Commentators have always interpreted the Heart Sutra with a massive dollop of confirmation bias. To each (and, more or less, every) translator the Heart Sutra represents a kind of epitome of their existing worldview, be it Yogācārin, Mādhyamika, Tāthāgatagarbhikā or Tantric. The importance of the Heart Sutra in this enterprise is that it is a canonical text that therefore authenticates and legitimises the view of the exegete, whatever the view happens to be. All Buddhists do this, but in the case of most modern exegetes they are reluctant to edit the text itself to conform to this view. We know that the text has been edited in the past. I've given links to examples of this. But consider that not only is each Sanskrit manuscript uniquely different from all the others (though sometimes this is only because of superficial scribal errors), but the three versions of the short text Heart Sutra in the Chinese Tripiṭaka are also different from each other in non-trivial ways (see also Variations in the Heart Sutra in Chinese). TNH's new translation is also interesting because it illustrates the procedure that a Buddhist might take upon discovering a mistake in their texts. The problem identified by TNH is a genuine one. It is not a matter of exegesis or interpretation, there is a flat and unambiguous contradiction in the Heart Sutra that has long gone unnoticed, but which TNH has noticed. I also noticed it, but he beat me to it by a couple of years, so all credit to him. My approach to this mistake is to highlight the problem and foreground it. I want the tension generated to create a change in perspective on texts in Buddhism and this requires holding the tension rather than seeking a resolution. As it happens, the problem in the Heart Sutra seems to be the result of an historic shift in emphasis in Mahāyānism that was inexpertly interpolated into existing texts some time in the early centuries of the Common Era (at least by 179 CE, when Lokakṣema translated Pañcaviṃśati). Thus, the conflict is also important as a signpost to changing Buddhist values and attitudes. Again, it is only by acknowledging the mistake and allowing it to stand that insights into the history of ideas in Buddhism come into focus. TNH acknowledges the problem and then "fixes" it by creating a translation that does not contain the problem. He doesn't just translate the text as a neutral observer, but actively changes the text to ensure a reading consistent with his views on Buddhism. He does not completely obscure the history of the text, because in a separate document he acknowledges the problem. But in simply changing the text he removes the tension that might motivate a shift in perspective. He is preserving the status quo. But then this is what we expect of establishment figures, even those who are eccentric translators. Another legitimating practice TNH uses, which we see quite often in Western Zen commentators on the Heart Sutra, is the invocation of Sanskrit to authenticate a translation from the Chinese. This can only happen in ignorance or rejection of Jan Nattier's Chinese origins thesis. It is supported by the general ignorance of Sanskrit amongst modern Buddhists. Sanskrit is an admittedly difficult language to learn, but the lack of knowledge of it means that commentators can make statements about the Sanskrit text that most of their audience will never question, nor have the skills to investigate. In my experience, commentators like Red Pine and Kaz Tanahashi who say they are translating from Sanskrit are pretty poor Sanskritists and heavily reliant on unnamed third parties (probably writing in Japanese) and the Chinese text. TNH's tries to imply that he was using the Sanskrit text, but clearly he was translating the Chinese text from T251. Just as I would foreground any textual problems, I would like to highlight these practices for dealing with them. It is, I think, a distinctive feature of Mahāyānism that, despite the canonisation of texts, they are still open to being changed. It's quite evident from the Chinese Tripiṭaka that this went on a good deal in India. On the other hand, I know of no similar example from the field of Pāḷi studies. So this is a fascinating insight into the world of Buddhist textual production and transmission. Active editing, fixing perceived problems, is practised, right up to the present. Though, of course, TNH has not edited a text in a canonical language; the source text remains the same, but the process of translating the text provides an opportunity to make corrections that monolingual transmission does not. In the final analysis, the new translation by TNH is not very good, either at representing the canonical text, or as literature. The new "translation" is, in fact, a palimpsest, a new text written over the top of the old. Not an interpretation, so much as a new composition which reflects the teachings of the author, rather than the teachings of ancient patriarchs. The Heart Sutra is a bunch of lines taken out of context, mangled by scribes and editors, and elevated far beyond original competency as magical amulet to protect from demons and misfortune. The content of it continues to baffle, but the bafflement itself symbolises something essential for many Buddhists: their bafflement with the world, with Buddhism, and with how Buddhism makes sense of the world (or doesn't). Yu, Pauline, et al. [eds] (2000) Ways With Words: Writing about reading Texts from Early China. University of California Press.